DC Motor Drive - SCR A compact, cost-efficient, reliable control for PM, Shunt Wound DC motors and Universal motors. 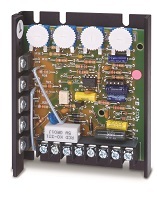 The 125 Series variable speed control incorporates up-to-date design and engineering into an amazingly small package. Installation and field adjustment are facilitated using a barrier type terminal strip and large, easily adjusted trimpots. Adjustable horsepower range – 120VAC, 1/50 through 1/8 HP and 1/4 through 1/2 HP; 240VAC, 1/25 through 1/4 HP and 1/8 through 1 HP. Standard features include an inhibit circuit for start-stop operation and 1% speed regulation over a 50:1 speed range. Dual voltage 120/240VAC or 24/36VAC models are available. Long life and quality are assured by 100% full load testing. The 125 Series is ideal for applications such as: office machinery, conveyors, packaging equipment, printers, process equipment, centrifuges, and exercise equipment. Project Description: Please describe your project and the type of product you're looking for. Remember that the more information you provide, the easier it will be for the supplier(s) to determine how they can assist you.